I suppose it’s appropriate that our day in London, home of the Bard himself, should begin with a complete comedy of errors! Our alarm for 5:45am did not go off. We awoke at 6:20am to the kids banging on our door! The irony of my sleep-crazed teenagers waking us up was not lost on me! This was the day we took the Eurostar train over to London for the day. In order to save money on the train tickets, we found we saved over $500 by going with a Viator one-day tour package, which included the 5 round trip train tickets, 5 “hop on hop off” bus passes, 5 one hour walking tour tickets (which we didn’t use), and and 5 tickets for a river cruise down the Thames river. Fortunately, I asked an official looking employee where we needed to be and she directed us to the right place! Viator (who was bought out by trip advisor several years back) uses local tour groups to provide the local services, and our guide was wearing a red vest and holding up a sign: Paris Vision Tours. She handed over all of our tickets, and bid us adieu! 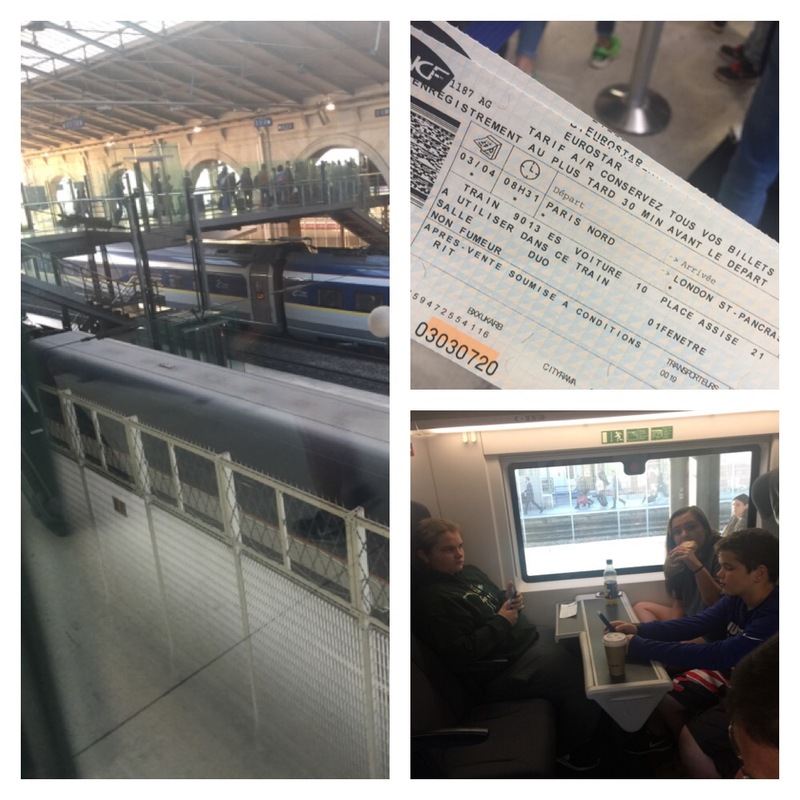 We found our way through security and onto the Eurostar train. The train took off at 8:30am and arrived in London at 10:00am- after dashing under the English Chanel at 187 miles per hour! The Eurostar train is an awesome way to travel, particularly with families. The seats are comfortable and there are tables with the seats facing each other so it is easy to play cards during the trip! Train car #9 had the snack bar, where we purchased Croque-monsiers and Caesar wraps, drinks, and chips. The ride was only two hours and twenty minutes, and it was exciting to realize we were speeding along at 187 mph as we plunged under the English Channel! We arrived at the St. Pancreas station in London, cleared customs, and were greeted by our “CityView Tour” rep. He was a nice enough fellow. He provided us with a map of bus stops and told us which blue, open top busses were included on our tour. We thanked him and hopped on the first blue double decker we saw, climbing immediately to the open-air top floor. We got off what would be our only bus for the day about one block from Trafalgar Square. We began walking toward the “Floating Yoda” who was performing when I’d been here in June of 2016. We wandered through the square, where passionate activists were yelling into loudspeakers in front of the National Art Museum. 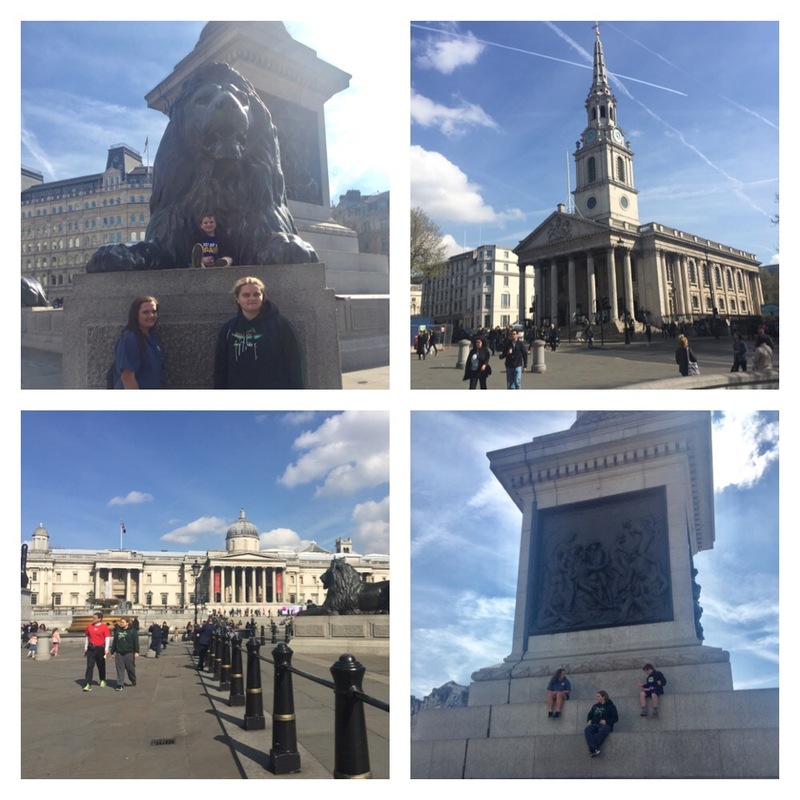 We made our way toward the 169 foot Nelson Column guarded by four giant lions, where we got some good photos. The photos continued as we passed the iconic red phone booths on our way to Piccadilly Circus! The kids were truly able to enjoy the British pride that flew on flags and was marked on every bit of merchandise imaginable! We enjoyed the shops and general heartbeat of the area before making our next move which would be to St. Paul’s Cathedral. After realizing we would have to back track to wait for the next bus, and believing it would take up too much of our precious day, we opted to travel like the Americans we are-we “Ubered” to our next stop- a mere £9 for all five of us! (A small price to pay to ensure we got to see all the stops on my list!) We ordered an Uber to take us to St. Paul’s Cathedral! The Uber driver, adding to our comedic theme, missed us in the Piccadilly madness, then was stopped by the police trying to pull a fast turn! 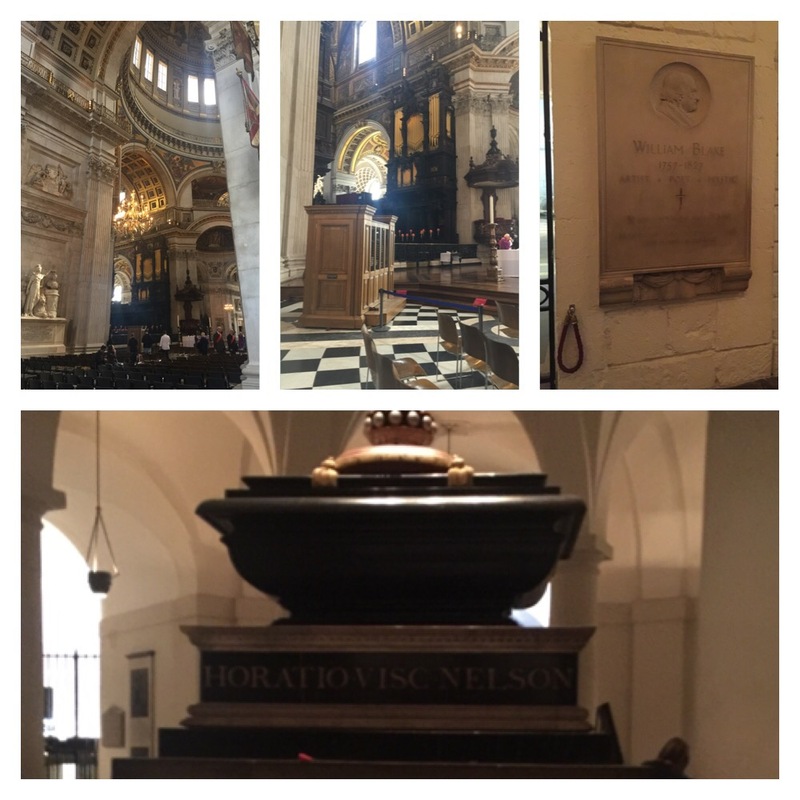 He finally connected with us and dropped us off at the foot of the stairs at the breathtaking St. Paul’s cathedral. The kids didn’t care about going in, so we told them to sit on the steps and watch the pigeons for a bit- we were going in! 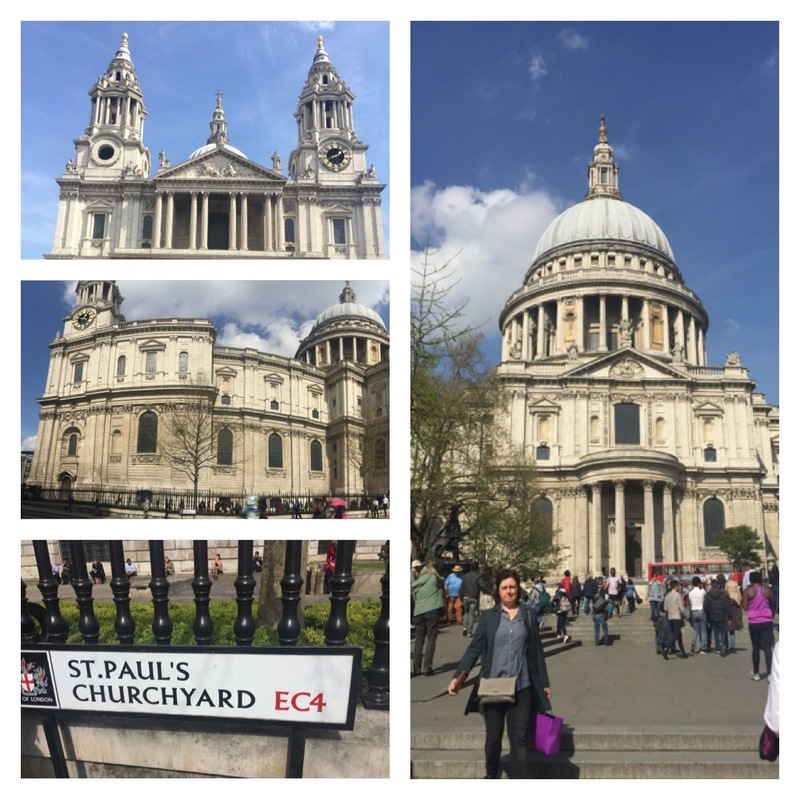 I was thrilled to have a look inside St. Paul’s, as I didn’t get to go in when I was last in London. As a teacher of British Literature- with a particular soft spot for the Romantic poets who often reference this church- I was thrilled to take a self guided tour complete with headsets. The dome ceiling gave way to a breathtaking ceiling of artwork. I can now imagine the entrance of the poor children of London who were paraded in to the church each Easter- the flowers of London as William Blake liked to refer to them… I enjoyed going below the church to see Blake’s memorial, as well as the crypt of Horacio Nelson. Once we left St. Paul’s, we set out on foot to the Thames River- passing the London School for Boys and crossing the Millennium Bridge. This is the bridge that Simon- my EF Tourguide from June of 2016- said was famous for the “gum art”! My kids got a kick out of that! Halfway across the bridge we stopped and bought some hot, caramelized almonds from a street vendor…. they were to die for! They were gobbled up before we made it to the other side of the Thames! On the other side of the bridge we made our way to the Globe theater! 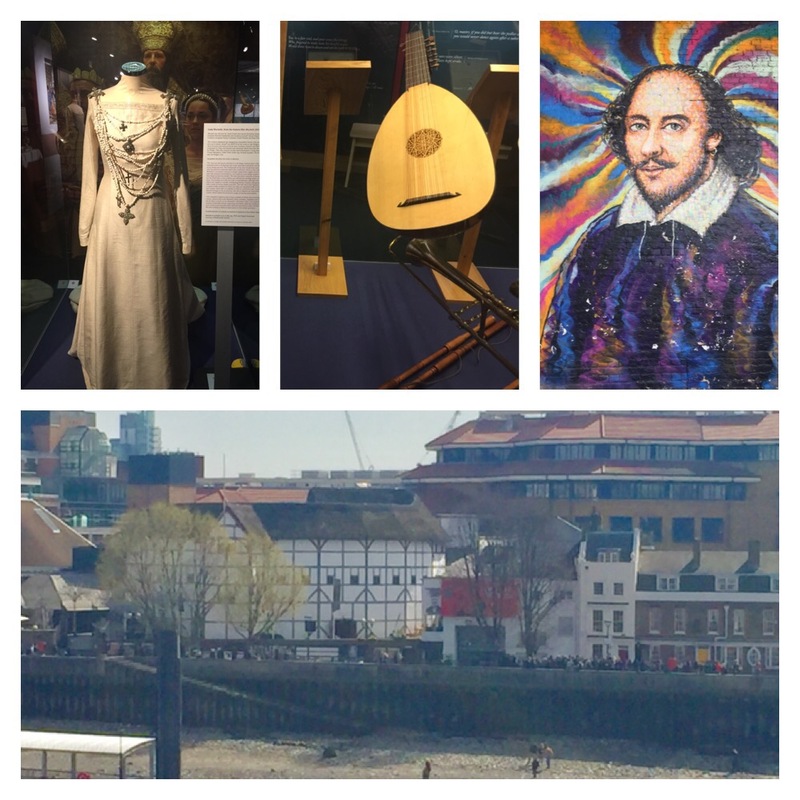 We took the museum tour and enjoyed seeing the history of Shakespeare’s theater, as well as costumes, props, and instruments! After leaving the Globe, we walked all the way down past London Bridge to Tower Bridge. I was tempted along the way by a spooky theatrical opportunity to learn “the history of London Bridge”, but opted to continue on our days journey! 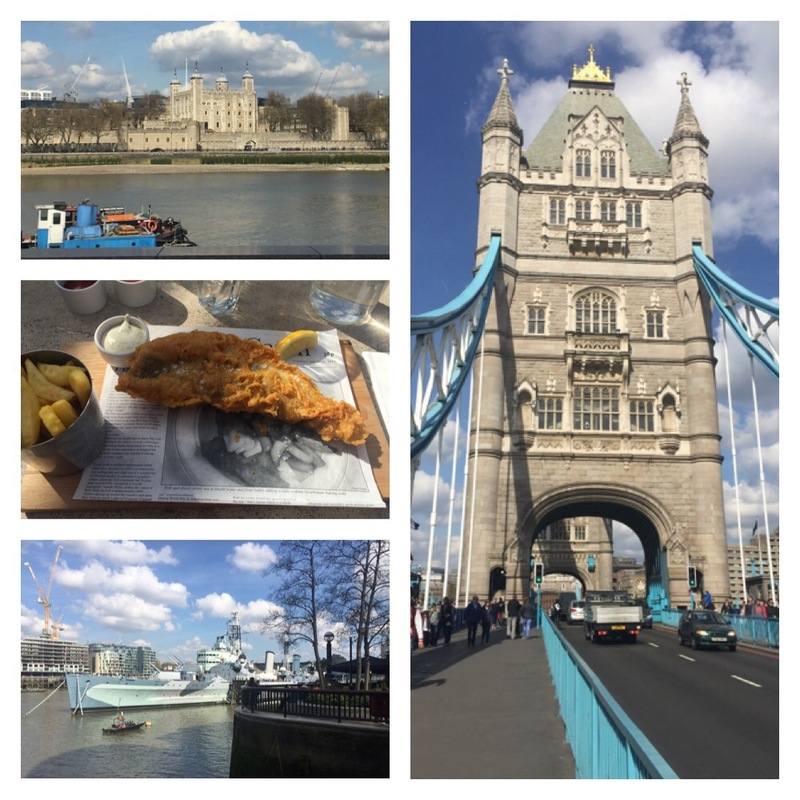 We crossed the beautiful Tower bridge and stopped for lunch at a place right next to the walls of the Tower of London! We enjoyed a local beer and traditional fish and chips! After lunch, we made our way down to the Tower pier- where we got on our Thames river cruise down to the London Eye. I hardly call this thing a cruise- it is really a water taxi! Unless you sat outside you couldn’t’ see anything out of the completely fogged windows! As we cruised down the Thames, however, we got great views of Big Ben and Parliament. 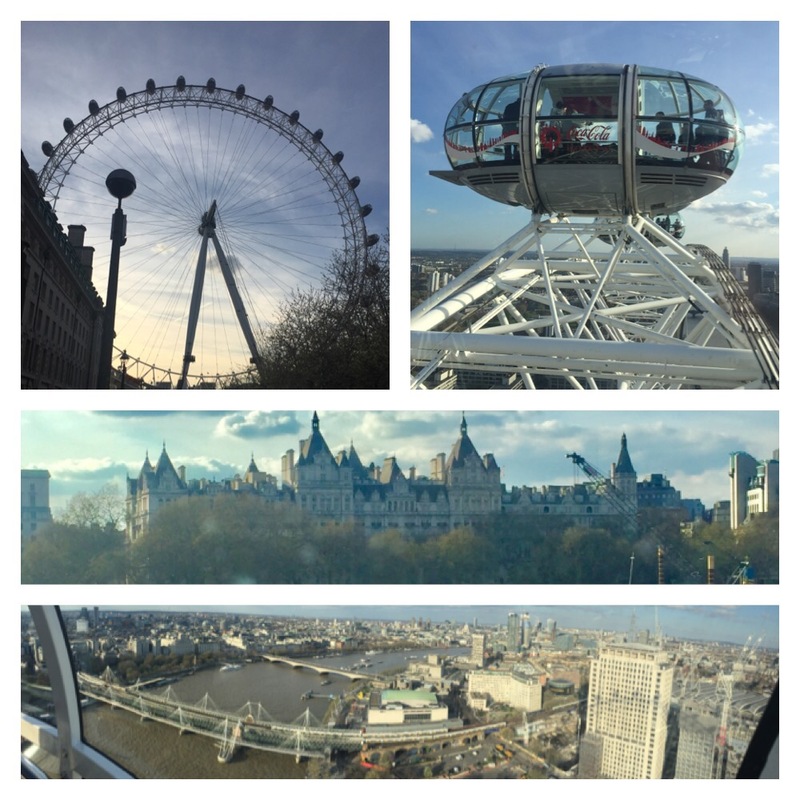 We departed the river boat at the London Eye. We made our way to the ticket center, got tickets, and got in line. The line moved pretty quick- we were in our little capsule within twenty minutes. The views were really quite spectacular! You could see Big Ben, Westminster Abbey, the Shard, the Thames, Whitehall Court and so much more! The ride lasted about thirty minutes- really pushing our time limit in the city. After departing the Eye, we opted to Uber our way back to the train station- where we were an hour later than they recommended. When we got dropped off at St Pancras, we walked in- and my priority was to find the WC! Hannah insisted that I look at the tickets and tell her the train number. It was 9054. We all looked up at the screen and it said- “Final boarding!” What!!?? The comedy ensued! Luckily, we made it three minutes before they closed the gate. Phew! We would make it back to Paris after all! When we got back to our hotel, we found the final act of our comedy of errors was in full production… our hotel has no electricity until 7am. So- I am typing this blog on my cell phone, with the hope that my battery will see it to its finish! And it has. The sounds of the city will now lull me to sleep until tomorrow!